There are few screen romances as beautiful and timeless as Charlie Chaplin's legendary City Lights. Made in 1931, City Lights is sometimes referred to as Chaplin's final silent film, although it did use sound effects to comedic effect, and 1936's Modern Times was essentially a silent film as well. Sound film was in its infancy when Chaplin began work on City Lights in 1928 (Chaplin was a perfectionist with notoriously long shooting schedules). Having begun his career as a pantomime artist, Chaplin refused to give into pressure to change his methodology, even as the public embraced the new technology. For his part, Chaplin sniffed at the new cinematic frontier, even going so far to as to satirize it in the opening scene of City Lights, where self important city officials pontificate from a podium, accompanied my droning nonsense noises simulating speech. To Chaplin, a consummate physical comedian, words were unnecessary, and here he deftly demonstrates why. Chaplin's "Little Tramp" character had been well established by 1931, having been a cinematic staple throughout the teens and twenties. The character had certainly evolved over time, from something expressly comedic to a mix of comedy and sentimentality, not necessarily something audiences were willing to accept at the time. But audiences embraced Chaplin all the way, even as the sound era threatened to make him irrelevant, and other silent comedians like Buster Keaton and Harold Lloyd fell by the wayside. City Lights is both an uproarious comedy and a tender romance, in which Chaplin's Tramp finds himself mistaken for a millionaire when he climbs through a limousine by a lovely, blind flower girl (Virginia Cherrill). He is immediately smitten with her, and buys a flower from her. But when the limosuine's owner returns and drives away, she thinks he has left her. But he remains behind, watching from a distance. And continues to find reasons to bump into her. The ruse of his identity, however, becomes harder and harder to continue, as the Tramp sets about trying to find money to help her keep her small apartment before she is evicted, leading to increasingly wild circumstances and one of the most beautiful denouements in the history of cinema. In fact, that final moment, when the flower girl, able to see for the first time, realizes that the Tramp in front of her is really the man who has been taking care of her all along, is perhaps the image that Chaplin remains the most famous for. That look of guileless glee in his eyes as she sees him for the first time is pure movie magic, and perfectly sums up what has made Chaplin so appealing for generations of movie goers. Chaplin had an innate ability to mix deep emotions with bawdy slapstick comedy. Whereas Keaton had a more cynical edge to his work (although I still believe Keaton's The General is the greatest silent comedy), Chaplin's were more sentimental, and in that regard, more balanced. They took audiences on a journey, the comedy stemming from our investment in the protagonist's plight rather from the technical skill of the gags, something at which Keaton consistently excelled. 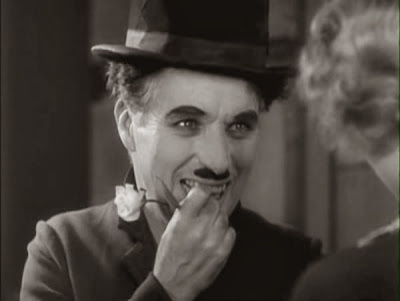 It is no wonder, then, that City Lights is often regarded as Chaplin's masterpiece. It is perhaps the quintessential Chaplin film, with images that have come to define modern audiences perceptions of him. It is magical film, as brilliant and majestic as the city lights from which it gleans its title. The Criterion Collection, having already released The Great Dictator, Modern Times, The Gold Rush, and Monsieur Verdoux, has pulled out all the stops for their release of his most iconic work. 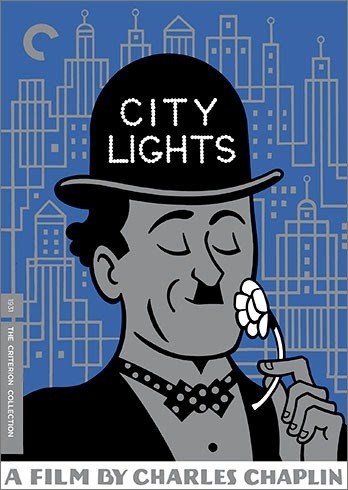 One of the company's first dual format releases, combining both Blu-ray and DVD, City Lights features a wealth of supplemental materials that are all available on both discs, including archival behind-the-scenes footage (which is of particular interest for Chaplin fans), and a documentary called "Chaplin Today: 'City Lights,'" which follows Chaplin's methods with Wallace & Gromit creator Peter Lord. This is Criterion's most essential Chaplin release yet, and one of the top Blu-ray releases of the year - a fitting tribute to one of the greatest comedies, and the greatest films, of all time. Now available on dual format Blu-ray and DVD from The Criterion Collection.